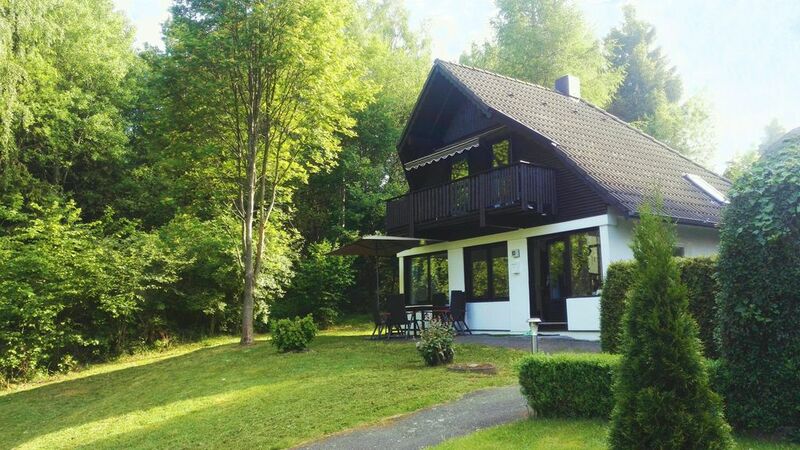 As the last house of a cul-de-sac, you will find this holiday home on holiday park Frankenau at the edge of the forest. The facility is located on a wooded hill near the national park Kellerwald-Edersee. If you want peace, relaxation or want to enjoy nature, you are right. This also applies to families with children, because here the kids can run around and play without it would disturb anyone. The house is offset so that your privacy is guaranteed. The building has a floor space of about 75 square meters, has three bedrooms and can accommodate six people. The single-storey holiday home is spread over three levels: On the ground floor is the spacious living and dining room with pellet stove, cable TV and Wi-Fi. Five steps later, you reach the second level with the fully furnished kitchen, the hallway and the bathroom. The bedroom has a double bed (160 x 200 cm) and adjacent thereto another toilet. In. 1 Floor leads to the other two bedrooms with two single beds and access to the balcony. All three bedrooms of course have plenty of storage space and room for a longer stay. Under the balcony is a terrace with chairs and Holztisch- and your car can be parked in front of the house. Cable TV, internet, heating, water and electricity are included in the price. The final cleaning costs of € 60 are separate and should be paid on the spot during your stay. Bed linen and towels can be booked on request for a small fee. In the nearby resort area Edersee itself offers an unlimited range of leisure activities. In addition to swimming and the famous water sports can also be found around the huge lake attractions in the country. Whether nature lovers, sportsmen, Sightseeing or families, each comes with the comprehensive tourism offer at its own expense. Even in winter, the holiday park Frankenau is a superb holiday destination. Within a short time (45 min.) You are in the ski resorts of Züschen, Winterberg and Willingen. In about 800 meters away Frankenau you will find plenty of shops and restaurants, so you have to spend in your precious holiday season no long ways or times for shopping or eating. The proven clearest and cleanest air in Hessen Find the way with us .. take a deep breath! We look forward to your visit. Es hat uns sehr gut gefallen, der Vermieter ist super freundlich und jederzeit erreichbar. Die lokale Hausverwalterin kommt sofort, wenn man ein Anliegen hat. Das Haus ist super gepflegt und man kann sich hier sehr gut erholen. Daher sehr zu empfehlen. Wir würden immer wieder in dieses schöne Haus im Ferienpark Frankenau kommen. Gemütlich und super eingerichtet, wunderbare Lage zum Wandern! Schöner Platz für einen Kurzurlaub mit Hund!!! Sehr schönes Haus und netter Vermieter! Wir haben nichts vermisst; alles komplett vorgefunden. Für zwei Erwachsene und Hund optimal; könnte mir vorstellen, dass mit vier Erwachsenen der Platz im Badezimmer etwas eng ist, aber machbar. goed verzorgd huisje, van alle gemakken voorzien. Prima huisje aan bosrand. Ruime kamers en goed sanitair. Eenvoudige bedden, maar wel comfortabel. Fijne pelletkachel die het huis goed kan verwarmen. Klein minpuntje is dat het vrij gehorig is. Wij waren zeer tevreden over ons verblijf.